How ClearTax becomes India’s number #2 choice in filing Tax returns? ClearTax is the first India focused startup widely accepted by the market after the startup accelerator programme, i.e. Y Combinator. ClearTax helps individuals in e-filing their Tax returns online via their website. All a user has to do is upload their Form-16 in PDF format and ClearTax’s proprietary software uniquely prepares the tax return instantly and automatically. ClearTax reads everything and fills out the correct tax form at the right places. Based out in Delhi and founded in 2011, the startup already has a strong presence in India, where it automates the income tax filing process for workers. Last year, over 300,000 people used ClearTax platform to file their taxes. Why we chose ClearTax as Startup of the Week? • The entire e-filing process has been made super easy and takes as little as 15 minutes. • The company has Chartered Accountant-assisted services for filing individual tax returns. • The platform offers concierge like service for NRI tax returns. • It also offers filing services for small businesses. • It is the first India-focused startup to get picked up for the YC programme. • Its tax cloud platform hits a key milestone of over 10,000 CA firms across India this November. • It has also partnered and tie-ups with various banks and corporate businesses to further ease the tax returns filing for individuals and businesses. • It has over 13688 fans following over Facebook with word of mouth advertisement model. • It has partnered with Paytm. ClearTax offers users a small mobile recharge on Paytm in exchange for referrals. • In 2014-15, over 300,000 people used ClearTax to file their taxes. • An estimated 1 million users filed their returns using the site for the assessment year 2015-16. [su_box title=”More startup of the week choosen by DSIM:-” box_color=”#c7c7c7″ title_color=”#000000″ radius=”5″] 1) How Curofy, an idea of 3 IITians is changing the health sector in India? ClearTax founded in 2011 by Archit Gupta along with his father Raja Ram Gupta, a Chartered Accountant is superb software that eases the way of filing tax returns in India. Archit, an IIT Guwahati alumnus who went on to pursue masters in Computer Science from the University of Wisconsin-Madison, joined hands with Srivatsan Chari; and Ankit Solanki to successfully launch his venture. 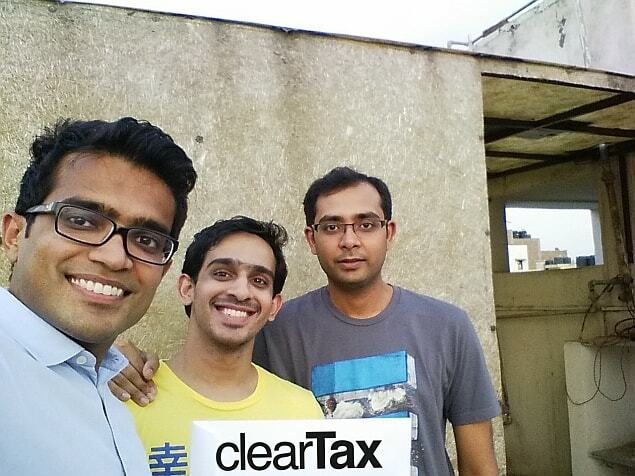 ClearTax was selected for Y Combinator Summer batch of 2014 as one of 47 startups. It was only the fourth Indian startup to be ever funded by Y Combinator and the first one to be focused on the Indian market. Archit was pursuing Ph.D. but was taken by Data Domain Inc. He worked there for almost three years in the Silicon Valley and this was the time when he got motivated from the Silicon Valley startup culture. Data Domain had an interesting story in itself which combined with EMC for a massive $2.1 billion acquisition and this proved to be a great teacher for Archit with lot of learnings as he was able to witness the whole cycle. “I had a lot of friends who had started up here and had acquired some valuable exposure to how the Valley works,” says Archit. The desire to startup on his own was always there and coming back to India was more of a gut driven move. He got together with his father who is a CA and this is how ClearTax landed on the track in 2011. • The startup reaches out to large corporations and then offers ClearTax for free or at a discounted rate to their employees. The business is based on B2C and B2B model. The companies taking corporate use of ClearTax are Royal Bank of Scotland, as well as major startups like InMobi and Flipkart. • One of ClearTax’s biggest growing markets is NRIs. Indian citizens living in other countries have a service made specifically for their needs that costs $40 to them. • ClearTax has a special product for businesses, which are currently targeted toward freelancers and small businesses. Most of ClearTax’s enterprise clients are freelance photographers or work in tech-oriented industries, including web design and development. ClearTax’s accountants help them claim expenses, which in turn can increase the amount of their tax return, by asking them questions over a phone call. ClearTax’s main competitor is the government owned system to file TDR, but it is as much complicated to use that people need to figure out which out of the seven tax forms they need to fill out. So apart from the government owned system, ClearTax also competes with HR Block, which launched a website in India last year for tax filings, as well as startups Taxmile.com and Taxspanner.com. ClearTax wants to help every tax payer in India to e-file their Tax Return via ClearTax. The plan is to keep on growing in India and help every single tax payer in e-filing. If users want to self-file, they have software. If users want a CA to assist them in their tax returns, the company offers CAs to them. If users go to an outside CA, the company hasTaxCloud India which is India’s largest online platform for CAs to e-File today. Overall the company is very much excited about android and the opportunity it offers. ClearTax has recently launched its mobile app to cater its outstanding services to users. Softly covering the Indian market, the company plans to target the global market.